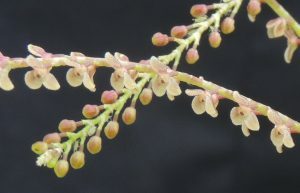 We have another delightful Stelis species flowering for you today. Stelis polyantha is has tiny flowers compared to the other Stelis species this week but they are a lovely soft pink colour. The species comes from Ecuador where it is found in cloud forest at around 3000m. 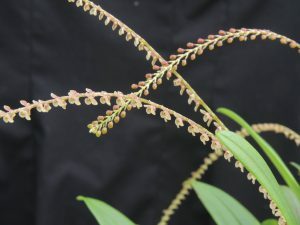 The small size of the flowers is made up for in the number of flowers per spike and the number of spikes produces that give a pinky ‘cloud’ around the plant when in flower. We grow the species mounted and low down in Cool Americas where we keep it well watered and shady all year. 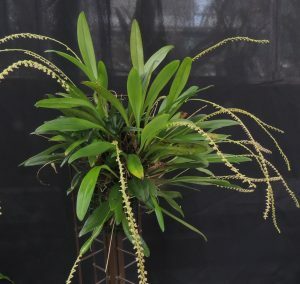 The plant shown lives on a mesh tower sitting about 20cm above the floor and so as cool as it gets in the greenhouse on a hot day.